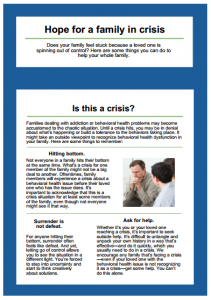 When an individual’s struggle with addiction or mental illness reaches a crisis point, family members often believe an intervention is the best—or only—course of action. Reality television shows portraying scenes of fear, blame and drama as a suffering individual is bundled into a car on the way to treatment are most people’s only exposure to intervention. At Family Recovery Resource Experts, we are not just interventionists; we are family therapists. As such, we take an approach that emphasizes safety, trust, collaboration and empowerment as we engage the whole family in healing from addiction or mental health issues. We work intimately within your family system to create the most effective plan possible—including treatment resources—involving everyone affected by your loved one’s addiction, mental illness and other behavioral health issues. That may mean talking as a family to share how relationships have been negatively affected and through open, honest, loving dialogue, encourage the individual to seek treatment. But it may also mean helping family members adopt healthy behaviors that influence their loved one in positive ways. Read more about our approach to intervention. Our dynamic family services will determine the best solution to fit your specific situation—there is no one-size-fits-all approach. Finding the right solution, whether it’s a traditional intervention, a collaborative intervention, or family therapy, takes work. But when your family learns to grow together, the healing you will experience will be worth every bit of effort that you put in. We can’t control our loved one’s actions. You have tried everything you can to help your loved one. Sometimes our actions, no matter how well-intentioned, can make things worse. Everyone adapts to their environment. Sometimes those adaptations show up in ways that unintentionally cause damage to relationships and a sense of self. Once the crisis is averted, the work begins. It’s common to assume that when an individual goes to treatment, the rest will work itself out. This is only the first step —the lasting changes are yet to come. Family Recovery Resource Experts will guide you through all the unknowns that come up when your loved one decides to enter treatment. There are many different types of treatment available, and a number of ways to afford the best services for your family. In addition, our professional counselors will help you navigate payment options to ensure that services match the needs of your family. Get in touch for an initial consultation with our team of compassionate, experienced professionals. There is never a wrong time to get help. Watch this short video to learn what to expect when getting the process started with FRrē. Does your family feel stuck because a loved one is spinning out of control? Download our free ebook, “Hope for a Family in Crisis,” which provides tips for helping the whole family through mental health or addiction issues.